I am currently a student at DePauw University, with an expected graduation date of May, 2012. I have received the Rector Scholarship here at DePauw, which is a four-year, full tuition merit scholarship. I am a member of the Management Fellows program, which is a selective business honors program, requiring internships, lecture series attendance, and professional development courses and activities. I am also the Vice President of Finance for the Resident Student Association, an organization on campus, where I manage a $40,000+ per year budget. I am involved in Relay for Life, and I'm also a member of Big Brothers, Big Sisters (BBBS). In BBBS, I have a "little" at a local school, who I visit for a minimum of one hour each week. Also, I am a coordinator for the BBBS Bowl For Kids' Sake event, which is an event thrown to raise money for the program. I graduated from Grand Ledge High School with a GPA of 4.0/4.0, a class ranking of 1/434, and an ACT score of 33. I was named one of the "Great Grads" of the area, one of the top 25 scholars in the school, and was a member of the National Honor Society. I played on the Varsity Tennis Team all four years. While on the tennis team, I was named MVP my freshman year, won the Regional Champion title my sophomore year, and was a team captain both my junior and senior year. I was involved in Relay for Life through my time at GLHS. I was also on the yearbook staff and was Editor-In-Chief my senior year. I completed my 2009 Winter Term as an intern in the Finance Department of Spartan Stores in Grand Rapids, MI. At Spartan, I utilized Microsoft Excel every single day in order to complete numerous finance projects related to inventory management. Although I mainly worked in the Finance Department, I also completed a few projects in the Information Technology (IT) Department. Since this was one of my first internships in a large corporation, one of my biggest accomplishments was improving my networking and interpersonal relationship skills by conversing and interacting with the other employees. I have coached in the Grand Ledge High School Youth Tennis Program for 5 consecutive summers, starting the summer after my freshman year of high school. I educate 5 different groups of 6 to 7 kids on the fundamentals of tennis for 5 hours each day. I have learned to adapt my teaching in order to fit kids' learning styles, and I have improved my communication skills by talking to the parents each day. For the 2010 Winter Term, I completed an internship in the financial planning department of a firm in Lansing, MI, called The Centennial Group. I worked with about 15 advisors as they worked with their clients to develop financial plans. I also interacted with these advisors in order to develop a fuller understanding of a career in financial planning. Lastly, I utilized company software in order to develop computer presentations for the clients and to help The Centennial Group in their quest to go "paperless". By uploading and organizing documents in a program called Client Connect, I helped the advisors be able to attend client meetings with only their laptops in hand, instead of the huge paper files they had to bring along before. Being a teaching assistant in the Computer Science Department at DePauw has taught me a lot about the importance of learning how to communicate new ideas and instructions. I work with the professor to facilitate the teaching of Java Programming to a class of 30 students. I also tutor the students on in-class assignments and help them with different programming projects. I worked at Hungry Howie's Pizza and Subs for three years during high school. I learned a lot about how a small business runs and what needs to happen in order for it to be successful. While at Hungry Howie's, I worked on organizing orders in order to ensure accuracy and decrease customer wait time. Part of doing so included getting an entirely new computer system. I also trained new employees on how to use the computer systems and proper machine use. 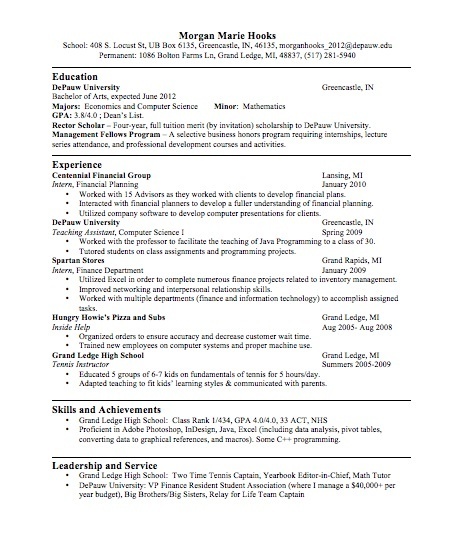 I have experience with data analysis, pivot tables, converting data to graphical references, and macros. I used Adobe InDesign in my journalism class and during my time on yearbook staff. I used Adobe Photoshop extensively during my time on yearbook staff.